Teach Laugh Plan: I've gone MAD!!!! 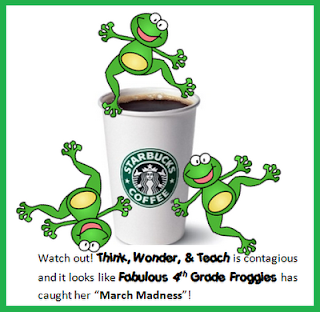 That's right I've caught the very contagious "March Madness" from my friend Misty at Think, Wonder & Teach. I met Misty through my Upper Elementary Linky party . I haven't even known her that long when all of a sudden I was feeling a bit weird..... my hands started shaking, my body was trembling, I couldn't speak but somehow I siad "I will give you a $10.00 Starbucks gift card for a give away!" What the what? Give away coffee? Anyone who knows me knows that have coffee running through my veins. They know I will give you the shirt off my back, but my coffee? I don't think so! So that's when I knew I went plum mad! For you chance to win the $10.00 Starbucks gift card visit Misty at Think, Wonder, & Teach by clicking on the picture above. Good Luck and be careful not to get bitten by the "March Madness" bug.....its contagious! LOL! It is contagious.... just wait until you see who else has gone mad! Thank you again for hosting the upper grades linky party! I've gained many followers through it and am very grateful!! Please head on over to my blog to claim your Lovely Blog Award! !